Upon turning the corner of the formal sitting room toward the great room of The Lodge, a vast open area draws you in with a sense of soft modern grandeur. 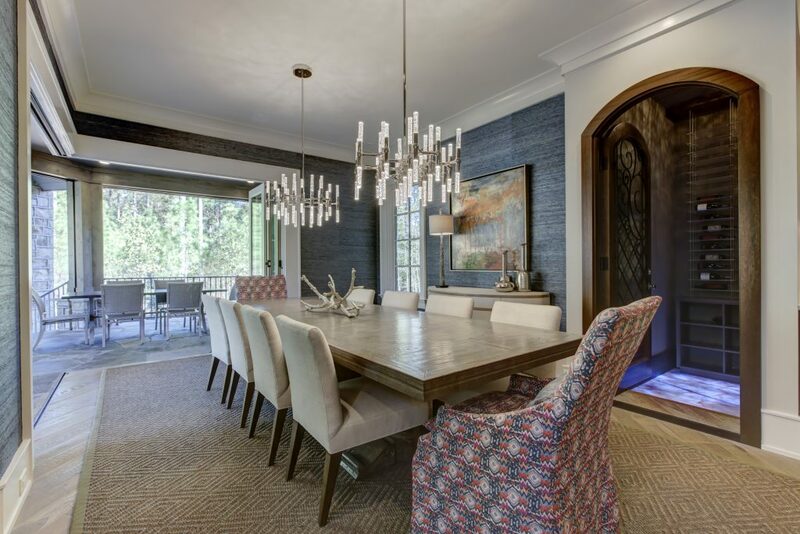 Made possible by a web of steel beams and engineered I-joists, this inviting space is anchored by a chef’s grade kitchen with complete openness to the great room and casual dining room. An ornate and professionally functional kitchen is only created by partnering with high caliber designers, suppliers, and tradesmen working in harmony; the kitchen in The Lodge is exemplary of that principle. We’d like to recognize the partners that helped make this kitchen the statement of luxury that it is. In the forefront is a 12 ft. island topped with a massive slab of Taj Mahal Quartzite, a South American natural stone harder than granite, and thus more scratch and stain resistant. This premium stone was supplied by CRS Marble and Granite and fabricated by Absolute Stone Corp. The quality of the slab and installation job is superb, granting a seamless look even where there are joints between two portions of stone. 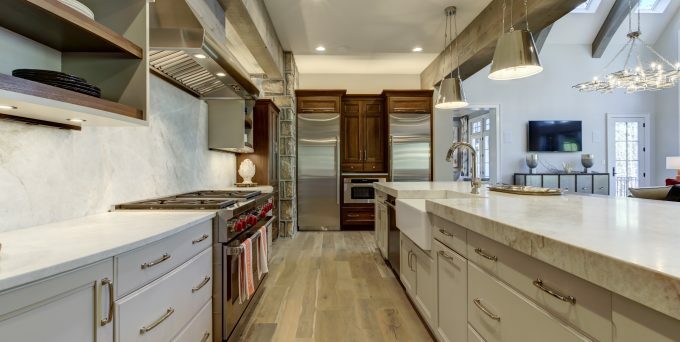 You’ll notice the uncluttered backsplash behind the range is dressed in the same quartzite. The layout of the cabinet design and appliance locations was painstakingly thought out by the combined forces of Kitchen and Bath Galleries and Bost Homes, resulting in an ergonomic yet elegantly soft kitchen. 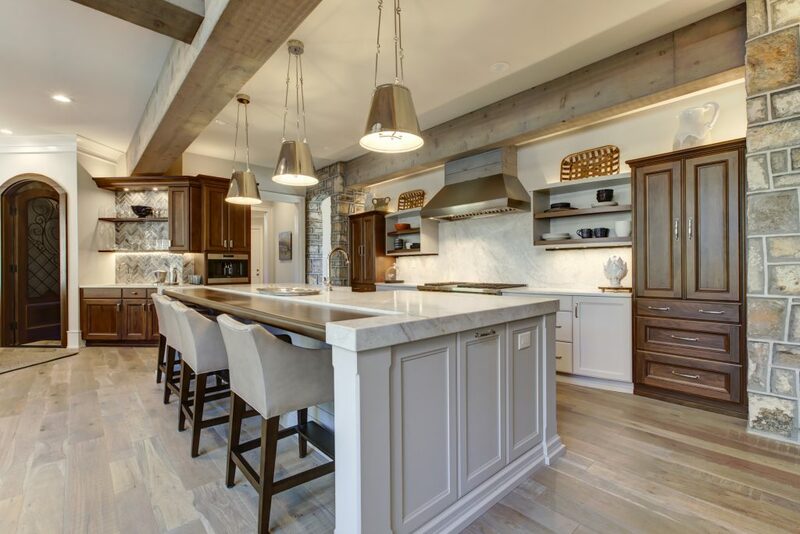 Via K&B Galleries’ we partnered with Crystal Cabinetry for all the custom walnut cabinetry and shelving in the kitchen and other areas of the home. 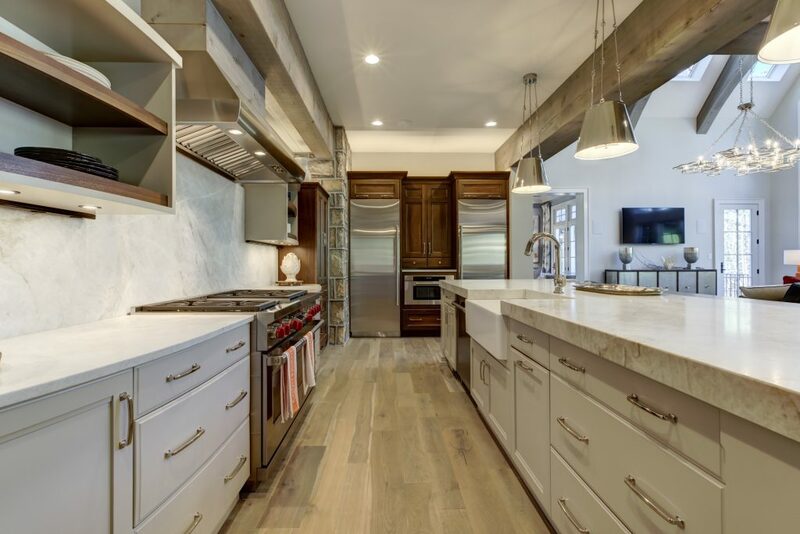 These cabinets were custom built per the kitchen design and crafted in a state of the art facility in Minnesota with a focus on environmental sustainability and top quality construction. Notice the subtle curve of the drawer boxes to the right and left of the stove. All the appliances are Wolf and Sub-Zero, and integrate into the cabinet design effortlessly. The inconspicuous pair of drawers beneath the Wolf coffee maker is a hidden pair of Sub-Zero refrigerator drawers, perfect for storing coffee creamers and cocktail mixers adjacent to the wet bar. Glass shelving and a dappled herringbone tile backsplash are illuminated by multiple tiers of recessed lighting in the cafe/wetbar station, which is laid out in a convex design to further accentuate the openness of kitchen, living, and dining. Just beyond the cafe is the wine room. Although wine cellars are typically just that, located in a basement, we believe it’s more enjoyable and convenient to have a collection on display near the main entertaining area in a home, which is increasingly the kitchen. 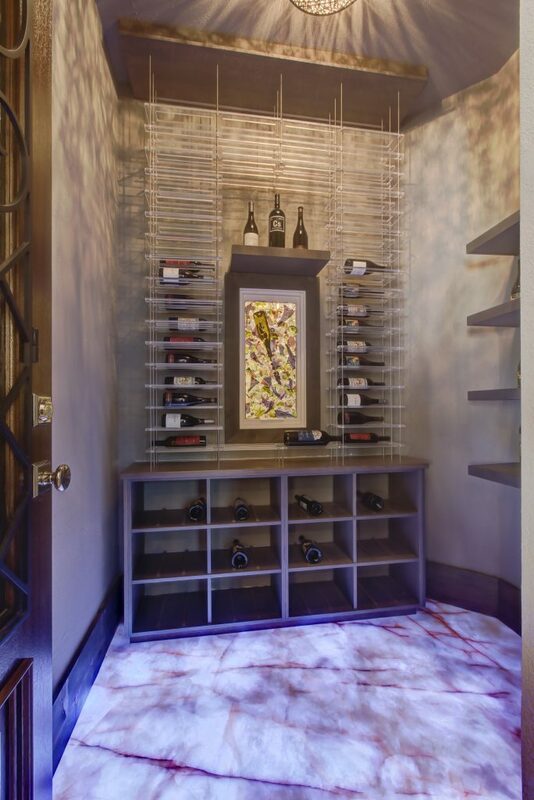 This wine room is tucked behind a DSA archtop iron, glass, and mahogany door, the LED backlit quartzite floor was designed and executed by Bost Homes, and the stone was provided by CRS Marble and Granite and fabricated by Absolute Stone. You’ll notice a custom stained glass art piece in the window – this was purchased at an art gallery in Hickory, NC made by a local artist. Stay tuned for the next installment of The Lodge at Avalaire’s Vendor Spotlight, within which we’ll take a look at the outdoor living and pool!